This year Marvel Studios is releasing a major motion picture with their creations “The Guardians Of The Galaxy” and while I am still on the fence about this particular film based on the trailer, this post is about the incredibly detailed action figures that will be coming out care of Hasbro Toys as they continue the Marvel Infinite Legends Series. I’ll keep it brief and let the photos do the talking and then offer up my thoughts at the close about this line. Longtime readers know how PiercingMetal has been attending and covering the Toy Fair since 2011 and bringing them the latest scoop on the coolness that falls right into our interest wheelhouse. Sadly, the Hasbro Show Room is offsite at this event and we did not get to go there but we did get some access to press provided images on several lines that I liked the most from this line. The photos do not show the figures in the packaging which is alright and they start off with “Drax The Destroyer”. 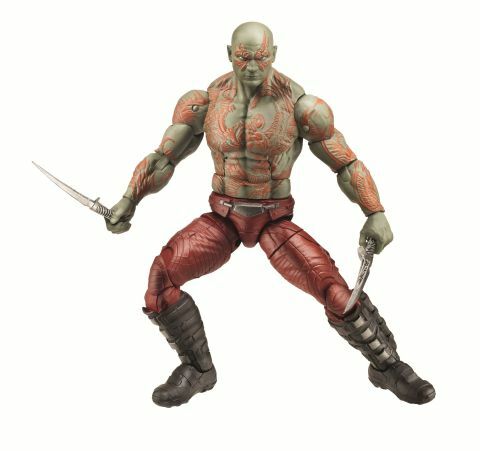 Armed with a couple of knives Drax clearly means business. While I am not the biggest gamer out there based on my hectic schedule, I did want to let our readers who love this kind of thing know that today is the day that “Batman: Arkham Origins” is being released. You’re excited about this aren’t you? KISS “Ikons” Trading Cards from PressPass Inc. When I was growing up and all of my friends were collecting Baseball cards I had to say that the things that appealed to me a whole lot more were those weird advertisements that were found depicted on the “Wacky Packages” stickers. My love of absurd humor and wisecracks combined with my interest in comic books probably led this to being the case and soon this all moved onto an interest in Rock & Roll music, most specifically anything that the guys in KISS were doing. In 1978 they made the collector in me go absolutely crazy by sanctioning Don Russ cards to release the first real set of KISS trading cards and I had to say that I spent a lot of allowance money on the things in my quest to complete the set. Back in this ancient day, the packs were only $.20 apiece and I think contained five or six cards along with a horrible stick of gum. There were 66 total cards in the set and the backs featured relevant KISS information and formed a poster. Here is a graphic of the original wrapper that I found while clicking around. As I looked at it, I recall having hundreds upon hundreds of the individual cards and yet in today’s world only think that part of a full set is even in my possession somewhere in a closet that I have safely kept them in for posterity. Since that time long, long ago there have been numerous other companies that delivered KISS in trading card form and each of them holds some special memories for the ardent KISS fan without any question. The bands reunion and makeup touring sparked a renewed interest in this sort of thing a few years ago and now thanks to the fine folks at Press Pass Inc., those collectors get yet another trading card set to add to their collection that is called KISS “Ikons”. I managed to get my hands on some samples of these wonderful cards and had to say that they made me feel like the kid who rushed to the candy store to buy those Don Russ cards back in 1978 all over again. In looking at the images that they used for the cards I had to say that they did a lot better than I thought they could have and even managed to now rate higher in my ranking of such things when I compared them to the already thought of as cool Cornerstone cards that we saw back in 1999. The trading cards had come a long way from the years of those Don Russ editions and thankfully there was no piece of plaster that was mislabeled as gum included in these. With so many different aspects in this set, I figured I would give a brief overview to better whet the palette for your love of all things KISS.